We’re happy to announce that the DAIM project is currently on display at the Danish Design Center as part of the “Challenge Waste” exhibition, which will be on for the summer of 2011. They showcase the project video, the 3 mini projects, and perhaps most prominently “the box” for user driven innovation in waste handling. Our book Rehearsing the Future has also gained quite a bit of exposure at various conferences and is being used as source book for several design courses. Recently the book has been shortlisted for the Creative Circle Award 2011. From these exciting announcements to a note in closing: The DAIM project officially ended in 2010. This blog will still be available for reference, but it will no longer be updated. The current exposure of DAIM seems a great trace to leave behind! 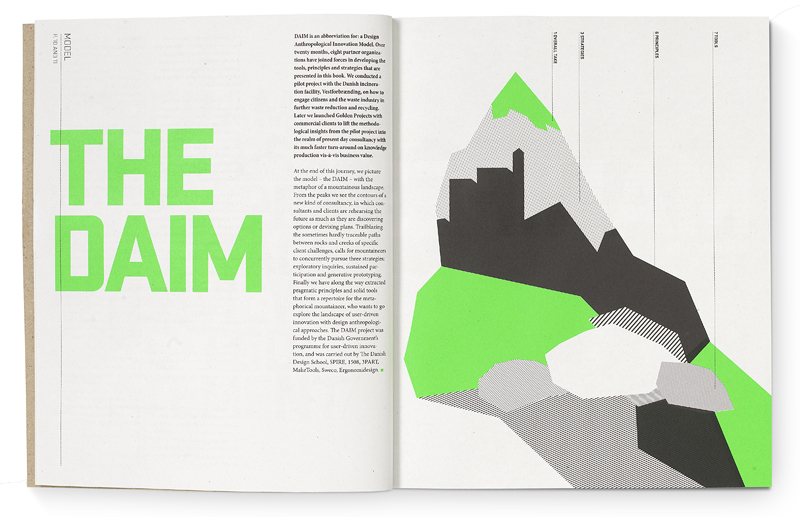 Danish center for design research has a nice piece on DAIM in their webzine. Check it out here! In the end of March, we defended our Master’s thesis, The Digital Design:Lab (DDL), which was done as part of the DAIM project. You can read our abstract here, and download the full report (Danish). In case of questions or comments, please write to Lene Nielsen: lni@itu.dk and Signe Louise Yndigegn: signelouise@itu.dk. Over the last decades, ethnographical and user-centred research methods have gradually become a fundamental part of the design process when designing digital products. This means that interaction designers have been faced with a great challenge and conflict of interests when striving to combine the commercial world’s often strict time schedules and optimized processes with the ethnographical methods aiming for deep and thorough understanding of the users and their contexts. The primary objective of this thesis, therefore, is to examine how to develop a digital tool that meets the challenges that are in play when working in rapid and efficient design processes while, at the same time, involving relevant stakeholders and potential users. The main part of the work with achieving this objective has been done within the Design Anthropological Innovation Model’s (DAIM) pilot project conducted at the Danish Design School. The DAIM project is focused on creating design processes with a strong user involvement that can be used in the daily design work in commercial companies. Our role in the DAIM project has been two-fold; on the one hand it can be characterized as active participation, and on the other hand as an apprenticeship. Through the participation in the DAIM project the digital concept »Digital Design:Lab« (DDL) has been developed to support and strengthen design processes with a high degree of user involvement. It is therefore important to acknowledge that DDL is not a replacement for real-world user research, but rather a strong complement to these methods. DDL essentially is a web-based solution that enables and supports collaboration, knowledge sharing and documentation in design processes by effectively combining ethnographically inspired user research and participatory design workshops. DDL’s theoretical foundation is to be found in the areas of design ethnography and participatory design combined with relevant theory about online communities and involvement of users in public projects. In practice, DDL has been developed and refined through a series of trials within the DAIM project. Live-blogging using video, images, and text from face-to-face meetings with users, both in the private and public spheres (known as »blog on the spot« in this thesis), as well as in workshops. Efficient sharing of material in multi-party design processes. A visual collection of primarily images and videos, supplemented with limited amounts of text, that provides easily accessible material that can be implemented in the design process. A mobile concept that can be brought out to the users in their context to support on-site research. A platform for preparation and analysis of workshops. The development of DDL shows that the web medium can contribute strongly to user- centred design processes, primarily by creating a social sphere where documentation and information flows are greatly enhanced. At the same time, this thesis shows that active and persistent user involvement in online platforms does not come by itself; it is resource-heavy and takes highly targeted and dedicated work by the designers. Hand-over: Inspiration in a box! 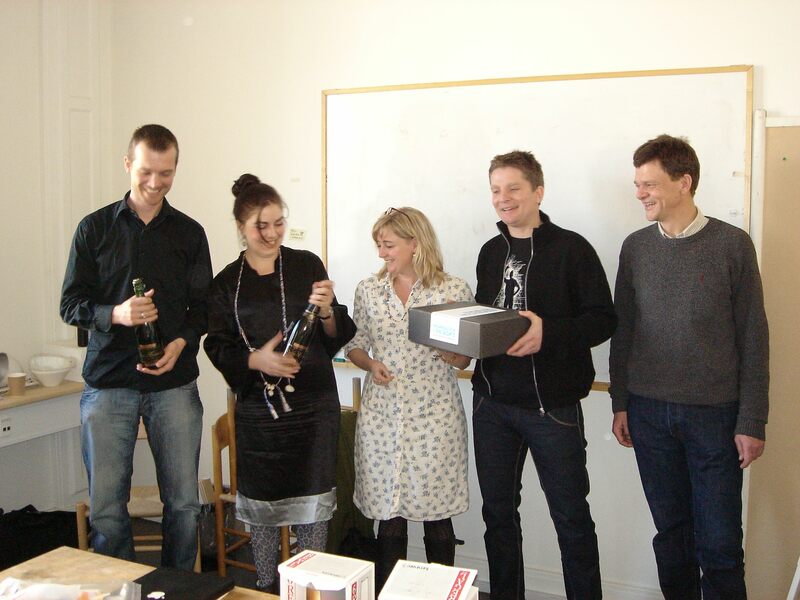 On the 2nd of April 2009 we handed over the DAIM pilot project deliverable to Vestforbrænding: “User-driven innovation in the waste sector: Inspiration in a box”. Obviously many people not on this photo contributed to the project, but the photo does capture the spirit of the reception: Central stakeholders at Vestforbrænding are excited about the potential of working with user-driven innovation, and Dan pulled out bottles of cava to celebrate the moment. Cheers!